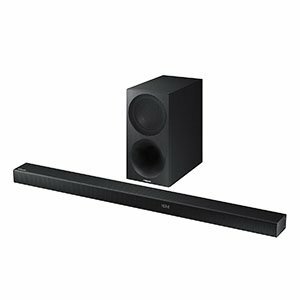 Going for a $300 soundbar setup is your ticket into lower middle range segment of the market. Some will debate whether this is true, but it is generally true. Compared to $100 soundbar, the models we are going to talk about today are pretty far ahead. Not only will they give you more options, but there are other significant improvements that really make a difference. We have prepared some of the best soundbars you can get in this segment, each of them bringing a pretty good performance for the money. Let’s take a closer look and see what they offer. A nice, simple design which—if it meets your use case—does a good job. Powerful bass that exceeds most of the competition. Meaningful options when it comes to audio modes. Can’t be wall-mounted, and the bulkiness can provide placement issues. Having been exploring the sound base market for a good while before most of their competitors, ZVOX’s expertise is demonstrated best in the ability of the SoundBase 570 to solve the twin issues of tinny treble and underwhelming bass response. Whilst the form factor isn’t for everyone, if it works for you this is a great choice. 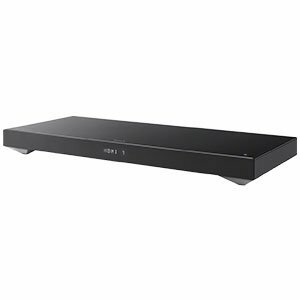 It is somewhat regrettable that ZVOX have not opted to allow this soundbar to be wall mounted given that this is one of the most common placement options for this kind of device. Sadly, its bulkiness prohibits it which means that you will require a good deal of space to place the 570 comfortably. The sound quality, however, certainly makes up for the size. A gorgeous, simple design that ticks all the relevant boxes. Sound quality is good across the board. Some nice extras that are the icing on the cake. The dimensions of the soundbar could be a little off-putting to some. Samsung has put a lot of thought into the HW-M550 in their attempt to offer a serious contender in the mid-range. In doing so, they have taken a lot of the audio performance from their more expensive models, stripped away only a couple of extras, and provided a great value product that performs well above its price point. It is worth noting that the bass response is particularly good in the HW-M550 model as this is an area in which soundbars often struggle given the nature of the form factor. Bucking this trend, Samsung has delivered a subwoofer which manages to perform well across the board and adds a real sense of immersion to the overall listening experience. A very strong option. VIZIO’s soundbars have built a very well known reputation in terms of performance and overall quality. VIZIO SB3851-C0 extends this policy of performance above anything else. It packs a hard but very formulated punch, making it one of the best in its class. As a matter of fact, it might even reach a bit above its price range. Depending on your tastes, you will either love or loathe the aesthetic simplicity which VIZIO has gone for in the visual design of this package. They’re essentially just black boxes capped with silver ends, and this may be enough to deter some buyers who are not interested in sharing their living rooms with anything that isn’t sufficiently eye catching. Other than that, you can’t go wrong. Shape might not fit every mount. 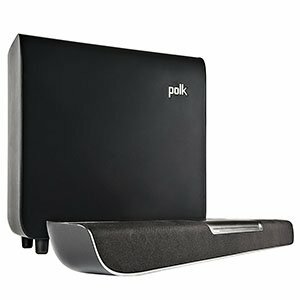 Polk Audio’s MagniFi One represents what happens when a brand decides to deliver a good value for their customer’s money. 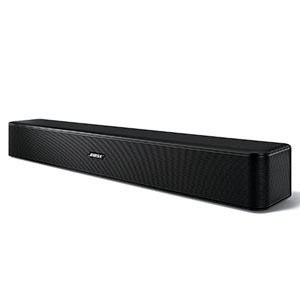 Stylish in design, this soundbar brings a great sound stage to medium sized rooms. Aside from the standard set, you will find some fairly rare features. This makes it a very attractive package. One potential downside for some is that this model suffers from being a slightly unusual shape which can make it something of a challenge to mount or even just to place within a room. You will likely have to find a special mount for the MagniFi One, which is by no means a deal breaker, but something that is worth keeping in mind when you come to purchase it. A very simple, pleasant design that is versatile because of its small size. Universal remote control is a nice idea. A total lack of presence during audio performance. Minimal customization options and playback modes. Whilst the Bose Solo 5 is definitely an improvement upon the tinny, distant sound produced by many TV speakers, it just isn’t enough of an improvement to cost as much as it does. It ultimately cannot compete with many others in this price range, and the versatility of its small form factor is made redundant by its lack of performance. It is particularly disappointing to find so few options for customization available as, with the right adjustments, it may have been possible to extract a better, more accurate, and more powerful listening experience from the hardware which is on offer. Overall, it just fails to perform in any meaningful way and you are best looking elsewhere if audio quality is your primary concern. What To Expect From A $300 Soundbar Speaker? One of the more frequently asked questions is ‘what can a $300 soundbar do that a $200 unit can’t?’ The answer is a lot. However, these differences won’t be too obvious on paper. At least not on what most manufacturers put up online. Let’s break it all down in different categories. We will go over each and see what the extra money buys you in terms of performance. First obvious difference is the quality of materials and components. Most affordable soundbars will come with neutral, rather average speakers. These are great if your only goal is to only get a slightly better audio quality than what your TV can do. However, if you are looking for genuinely good performance that transcends TV use and enters into music, you will need something better. Most of the models on our list feature carefully designed transducers. Seeing how many brands who make soundbars usually make reference speakers or monitors, these upgraded transducers are readily available. 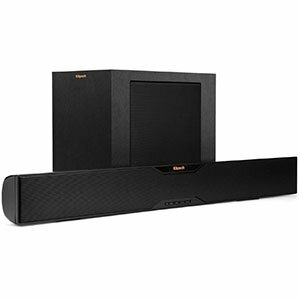 On a similar note, a $300 soundbar is going to come with more speakers and a more complex configuration of the same. We are talking tweeters, mid range drivers and subwoofer cones working together to cover the entire frequency response range. This is a standard that best soundbars on the market meet and exceed. Next come the features. Features are important, but they are also what most brands use as a marketing tool to attract new users. 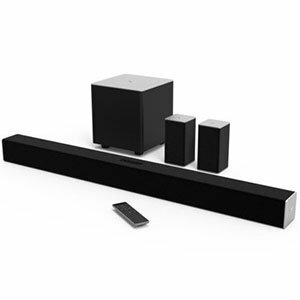 While wireless soundbars are common in $500 range, they only emerge in the $300 segment. Having wireless connection makes the whole setup much cleaner aesthetically. More importantly, it allows you to go ahead and put your bar wherever you need to without being limited by cable length. Full Dolby Digital surround suite or other proprietary technologies of the same type are common as well. Lastly we have improvements in overall design. With that said, we aren’t talking about aesthetics or exterior design solutions. We are interested in what is going on inside the soundbar and subwoofer. Advanced reflex pipes, ports and speaker positioning plays a major role in creating a solid sound stage. $300 soundbars will introduce you to that as well. The jump between affordable and midrange segment of the market is not as apparent, but it is there. We have shown you some of the best models and packages you can find in this price range. These perfectly explain what this short guide was trying to convey with words. Whether or not you will benefit from owning a $300 soundbar will always depend on your needs and how far are you ready to go to get the quality you want. With that in mind, this is the sweet spot segment for finding best value for the money deals out there.